This month you’ll create a Traveler’s Notebook to record your travels or scrap a vacation! 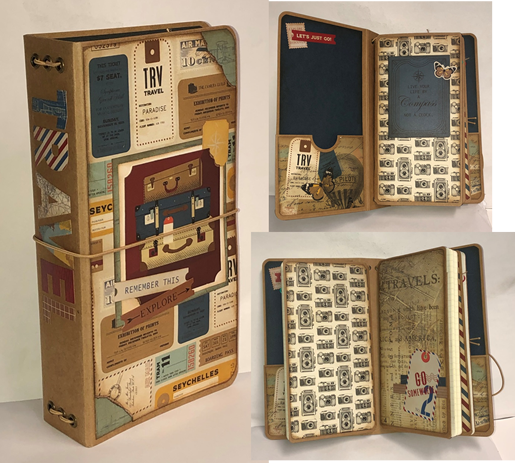 This class includes a Graphic 45 Traveler’s Notebook chipboard cover and three notebooks with pockets! The uses for Traveler’s Notebooks are endless and Katie can’t wait to share ideas, techniques and layouts with you through this series of classes. Bring Basic Class Kit, foam dots, Distress Ink: Gathered Twigs, blending tool, and ½” circle punch. Instructor Bio: Katie is our "planner girl" and was planning with planners before they were popular. She also loves listing, and using traveler's notebooks.